Last week, I spent a day in London working with the clinical staff of the Hertfordshire Partnership NHS Foundation Trust. The subject? Feedback, of course! As soon as I stepped off my transcontinental flight, I knew it was going to be a fun day. 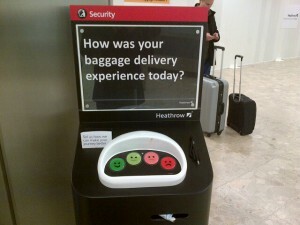 Every way I turned at the Heathrow airport I was greeted by a machine asking for feedback about my experience: after exiting customs, at the baggage claim area, at the duty free shops. Amazing! The process was as engaging as it was efficient. Tell us about your experience…by pressing a button bearing one of four different faces. The similarity to the ICCE Young Child Outcome Rating Scale was striking (to say the least). I felt compelled to register my feedback at every opportunity. From London, I travelled to Gotheburg, Sweden for the first Scandanavian Advanced Intensive Training in Feedack Informed Treatment. The event, organized by GCK, Gothenburg’s Center for Competence Development, sold out in a week with participants coming from all over Scandanavia. I taught the course together with ICCE Senior Associate Susanne Bargmann using a curriculum based on the FIT Treatment and Training Manuals. The series was developed to support, in part, ICCE’s application to the US Substance Abuse and Mental Health Services Administration (SAMSHA) for designation of FIT as an evidence-based practice. Together with the Training of Trainers (TOT) and Supervision Intensive workshops, the manuals and Advanced Intensive training provides participants with the latest, cutting-edge, evidence-based information and skills in FIT. Well…on that score, learning FIT, available evidence shows, leads to direct benefits to consumers of behavioral health services. Together with New Zealand based psychologist and ICCE Senior Associate Eeuwe Schuckard, I’ve updated the review of the research supporting FIT practice (click here). Don’t wait to learn about or deepen your understanding of and skills in feedback informed treatment. The Advanced Intensive scheduled for March 18-321st has a few spots left. You can register online by clicking here. By the way, shortly after the publication of Malouff’s review in Psychotherapy in Australia, I wrote to the editor, Liz Sheehan, and asked for permission to reprint the article. Click here to read it.